Tropical Storm Lionrock moved over Honshu, the big island of Japan and then proceeded over the Hokkaido, the northernmost island, when NASA's Terra satellite passed overhead and analyzed the storm's cloud top temperatures. On Aug. 30 at 8:55 a.m. EDT (1255 UTC) the Moderate Resolution Imaging Spectroradiometer aboard NASA's Terra satellite captured an infrared image of Tropical Storm Lionrock when it was centered over southern Hokkaido, Japan. 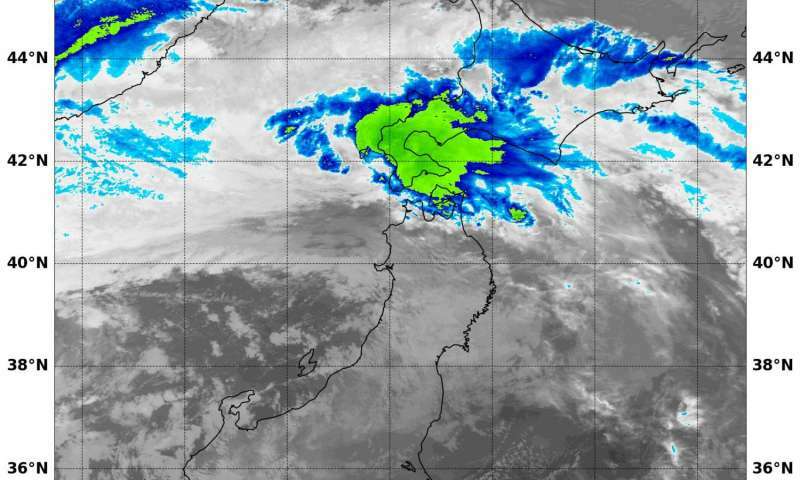 Infrared data showed some strong thunderstorms remained as cloud top temperatures were as cold as minus 60 degrees Fahrenheit. The higher the clouds the colder the cloud tops and typically the stronger the storms. On Aug. 30 at 11 a.m. EDT (1500 UTC), the center of Tropical Storm Lionrock was located near 40.6 degrees north latitude and 140.2 degrees west longitude. That's about 47 nautical miles west-northwest of Misawa, Japan. Maximum sustained winds dropped to 51.7 mph (45 knots/83.3 kph). Lionrock is moving to the north-northwest at 36.8 mph (32 knots/59.6 kph). Lionrock is weakening rapidly and is forecast to track across the Sea of Japan to Manchuria, where it will dissipate.